Jamestown, NY – The works of two Fredonia artists are among the selections for Women Create, the first juried exhibit of women’s art at the new 3rd On 3rd Gallery in downtown Jamestown, New York. 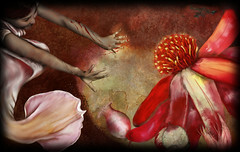 Women Create will exhibit a wide range of art and fine crafts in a variety of media. 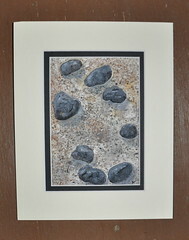 Jill Johnston’s mixed media print “Red Garden 5” and Sue McNamara’s mixed media “Simplicity of Rocks” will be on display from February 11 to March 31. With the show created to feature the work of local and regional women, the preponderance of artists comes from throughout western New York. Johnston and McNamara are the only Fredonia artists to be included. A native of Canada, Jill Johnston lived in the Baltimore area for 15 years where she taught animation, film production and digital imaging classes at the University of Maryland Baltimore County. She now lives in Fredonia, where she is the director of the new animation area at SUNY Fredonia. Her artwork explores the narrative format through animation, film, photography, and painting. The recipient of numerous awards, her work has been shown throughout the United States as well as in Croatia, Korea, Turkey, Australia, France, the United Kingdom, and more.